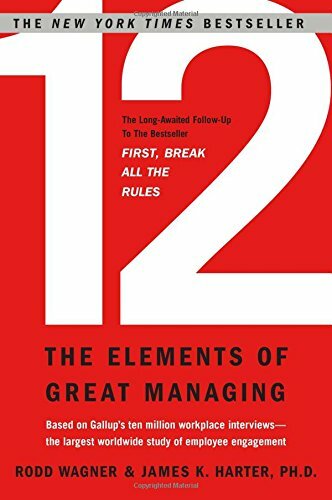 12: The Elements of Great Managing is the 2006 sequel to 1999's First, Break All the Rules, written by Marcus Buckingham and Curt Coffman. Based on Gallup's proprietary Q12 survey from the mid-1990s, 12 follows great managers as they harness employee engagement to turn around a failing call center, save a struggling hotel, improve patient care in a hospital, maintain production through power outages, and successfully face a host of other challenges in settings around the world. The authors weave Gallup insights from 1999 to 2006 with discoveries in the fields of neuroscience, game theory, psychology, sociology, and economics.